Cypress' C4 IP Unified Communications as a Service solution honored for outstanding network innovation for second consecutive year. For the second consecutive year, Cypress has been recognized for their exceptional work in advancing next generation network services and technologies. Cypress Communications® announced today that Technology Marketing Corporation (TMC) has named Cypress’ hosted unified communications solution, C4 IP®, as a recipient of the 2010 Next Generation Network Award presented by NGN Magazine. This is Cypress’ 28th award for excellence and product innovation. The second annual NGN Leadership Award has recognized the growth, evolution and distinction between the applications and services designed for next generation networks and the enabling technologies that make them possible. Cypress has been recognized in the services and applications category. C4 IP is a hosted VoIP and hosted unified communications solution that is named for its ability to help enterprises connect, communicate, collaborate and continue®. C4 IP delivers converged voice and data services and a powerful suite of collaboration tools that include Microsoft® Outlook integration, unified messaging, real-time presence, file and desktop sharing, chat, and audio, video, and web conferencing. With its advanced network architecture, Cypress offers unmatched levels of business continuity and disaster recovery. Beyond the inherent component and geographic redundancy that guarantees 99.999% availability and local site survivability, Cypress’ network also supports three failover options that can be customized for clients: VoIP failover, VoIP and public data failover, and VoIP and private data failover. And, since C4 IP is delivered as a fully hosted solution, SMEs can take advantage of the same enterprise-grade applications and technologies as their larger counterparts – while actually lowering their total communications spend. Cypress provides all the equipment and manages the solution from the network to the phone on each desk, so there’s no capital expense, no worries of technological obsolescence and no need for SMEs to hire or train additional IT staff to manage the solution. For over 25 years, Cypress Communications has been helping small-to-medium enterprises (SMEs) connect, communicate, collaborate and continue® with a range of fully hosted and managed voice, data and Internet solutions. Beginning in 2006, Cypress revolutionized the communications industry with its hosted VoIP and hosted unified communications solution, C4 IP, making it easy for SMEs to take advantage of productivity-enhancing technology such as integrated audio and web conferencing, multimedia collaboration tools, presence, chat, Microsoft Outlook integration, and more. As a Deloitte Fast 50 and Fast 500 award recipient, Cypress is recognized as one of the fastest growing telecommunication companies in North America. The company has also been named one of Atlanta’s Best Places to Work. Cypress’ hosted unified communications solution has received numerous awards and accolades for excellence and innovation to date. The company’s web address is http://www.cypresscom.net. To learn more about hosted unified communications, visit the company’s UC 360 blog at http://blog.tmcnet.com/uc-360. Technology Marketing Corporation (TMC) is a global, integrated media company helping our clients build communities in print, in person and online. TMC publishes Customer Interaction Solutions, INTERNET TELEPHONY, Unified Communications, NGN magazines and the website TMCnet, a leading source of news and articles for the communications and technology industries. TMCnet is read by two million unique visitors each month on average worldwide, according to Webtrends. 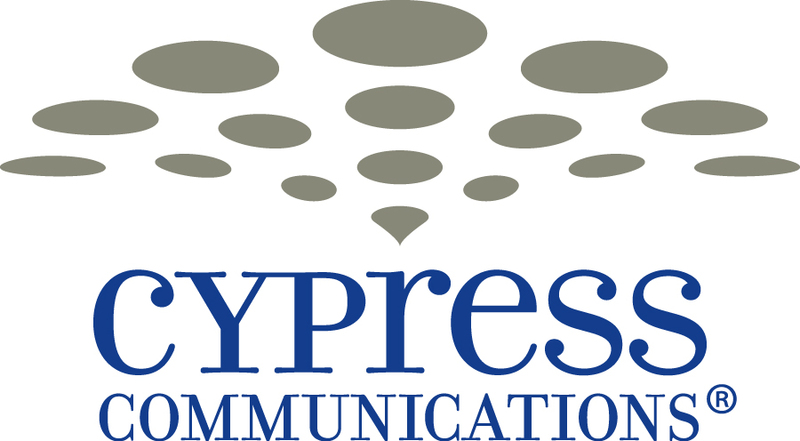 © 2006-2010 Cypress Communications, Inc. The Cypress Communications logo is a registered service mark of Cypress Communications, Inc. C4 IP and Connect. Communicate. Collaborate and Continue are registered trademarks of Cypress Communications. All other marks used herein are the property of their respective owners.